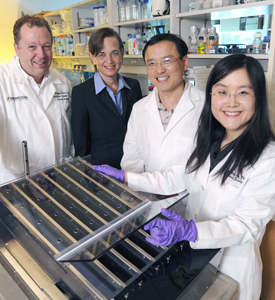 Dr. Philipp Scherer, professor of internal medicine and cell biology and director of the Touchstone Center for Diabetes Research; Dr. Beth Levine, professor of internal medicine and microbiology and director, UT Southwestern Center for Autophagy Research, Dr. Kai Sun, assistant instructor of internal medicine, and lead author Dr. Congcong He, a postdoctoral researcher. Autophagy is a process by which a cell responds to starvation and other stresses by degrading damaged or unneeded parts of itself to produce energy. It is sometimes called the cell’s housekeeping pathway. “Exercise is known to have many health benefits but the mechanisms have been unclear. Autophagy is also known to have several health benefits, and these benefits correspond closely to the effects of exercise. We hypothesized that some of the health benefits of exercise might be explained through autophagy,” said senior author Dr. Beth Levine, professor of internal medicine and microbiology who leads the Center for Autophagy Research at UT Southwestern. Dr. Levine, a Howard Hughes Medical Institute (HHMI) investigator at the medical center, decided to focus on one specific health effect of exercise – the ability of exercise to prevent blood sugar abnormalities in the face of a high-fat diet. Her mouse study provides the first evidence that exercise stimulates autophagy. This discovery led the team to investigate whether autophagy is important in the protective effects of chronic exercise on diabetes. A high-fat diet induced diabetes-like changes in blood sugar metabolism in both control mice and in test mice that were genetically unable to increase autophagy above baseline levels, said Dr. Congcong He, lead author and a postdoctoral researcher in Dr. Levine’s lab. However, the researchers found that exercise reversed these blood sugar abnormalities in control mice but not in the autophagy-deficient mice. “Our finding that exercise fails to improve glucose metabolism in autophagy-deficient mice strongly suggests that autophagy is an important mechanism by which exercise protects against diabetes,” said Dr. Levine. “It also raises the possibility that activation of autophagy may contribute to other health benefits of exercise, including protection against cancer, neurodegenerative diseases and aging. Dr. Levine has made fundamental discoveries previously that are in large part credited for expanding the field of autophagy research. In 1999, she identified the first mammalian autophagy gene, beclin 1, and its link to the suppression of breast cancer, which marked the first discovery of an association between defects in an autophagy gene and a human disease. She similarly is credited with demonstrating that autophagy functions in innate immunity – protecting against lethal viral encephalitis – as well as initially reporting that autophagy plays a role in lifespan extension, shown in a study of C. elegans worms. Other UT Southwestern researchers involved in the Nature study include Dr. Kai Sun, assistant instructor of internal medicine; Dr. Yongjie Wei, assistant professor of internal medicine; research specialist Zhongju Zou; graduate student Zhenyi An; computational biologist Dr. Qihua Sun; Dr. Milton Packer, chairman of clinical sciences and professor of internal medicine; research scientist Herman May; Dr. Joseph Hill, Dr. Joseph Hill, director of the Harry S. Moss Heart Center, chief of cardiology, and professor of internal medicine and molecular biology; Dr. Christopher Gilpin, assistant professor of cell biology; Dr. Guanghua Xiao, assistant professor of clinical sciences; Dr. Rhonda Bassel-Duby, professor of molecular biology; Dr. Philipp Scherer, professor of internal medicine and cell biology and director of the Touchstone Center for Diabetes Research; and former postdoctoral researcher Dr. Viviana Moresi of molecular biology. Researchers from the Dana-Farber Cancer Institute, Washington University and the University of California at San Francisco also contributed. The study was funded by grants from the National Institutes of Health and the HHMI.